The Adobe Photoshop and Adobe ImageReady work areas include the command menus at the top of your screen and a variety of tools and palettes for editing and adding elements to your image. You can also add commands and filters to the menus by installing third-party software known as plug-in modules. In this part of the lesson, you'll familiarize yourself with the Adobe Photoshop work area and open a file in Adobe Photoshop. 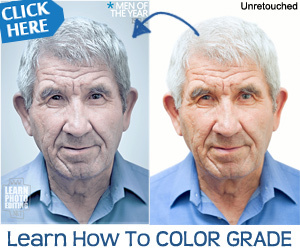 Both Photoshop and ImageReady work with bitmapped, digitized images (that is, continuous-tone images that have been converted into a series of small squares, or picture elements, called pixels). In Photoshop, you can also work with vector graphics, which are shapes made up of smooth lines that retain their crispness when scaled. In ImageReady, you can create moving elements, such as animations and rollovers, for on-screen viewing. You can create original artwork in both Photoshop and ImageReady, or you can bring images into the program by scanning a photograph, a transparency, a negative, or a graphic; by capturing a video image; or by importing artwork created in drawing programs. 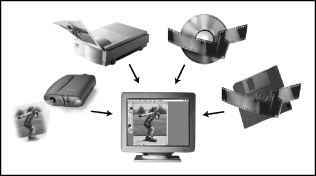 You can also import previously digitized images—such as those produced by a digital camera or by the Kodak® Photo CD process. □ For information on the kinds of files you can use with Adobe Photoshop, see "About file formats" in Adobe Photoshop 7.0 online Help. 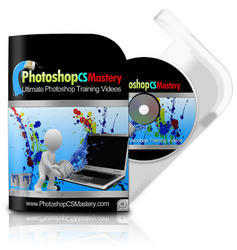 1 On the desktop, double-click the Adobe Photoshop icon to start Adobe Photoshop. If you do not see the Photoshop icon on your desktop, look for it on the Start/Programs/Adobe menu (Windows), in the Applications folder in the Finder (Mac OS 9 and Mac OS 10), or in the dock (Mac OS 10). 2 Choose File > Open, and open the file 01Start.psd from the Lessons/Lesson01 folder that you copied to your hard drive.